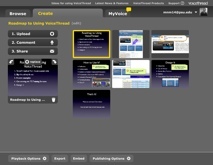 As more instructors throughout Penn State use VoiceThread, a collection of best practices has begun to emerge. This page provides links to a number of these current best practices and are listed below. This list will continue to grow as adoption increases at Penn State and faculty continue to share their experiences.